Constructed responses are text based writing prompts that encourage students to include textual evidence in their response. This activity is the perfect way to practice for the common core . Allow your students to annotate the text, discuss, and write about one of Poe's most celebrated pieces. Everything is printable and ready to use. 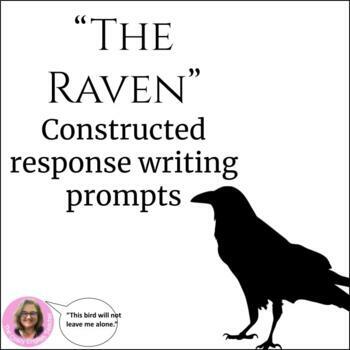 I have included the text "The Raven" by Poe, 11 constructed responses, mini poster for Essential question, mini poster for learning target. •	CCSS.ELA-Literacy.RL.9-10.1 Cite strong and thorough textual evidence to support analysis of what the text says explicitly as well as inferences drawn from the text. •	CCSS.ELA-Literacy.RL.9-10.2 Determine a theme or central idea of a text and analyze in detail its development over the course of the text, including how it emerges and is shaped and refined by specific details; provide an objective summary of the text.